The AA Box No 472 can be found on the A93 from Aberdeen to Ballater at Cambus O'May, Royal Deeside, Aberdeenshire, Scotland. It is thought to be one of only ten preserved Automobile Association Boxes in the UK. Another example of an AA Telephone Call Box can be found on the A149 at Brancaster, England. 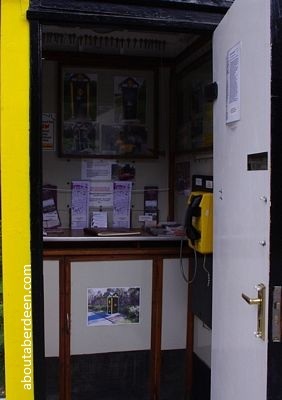 There is a small layby to allow visitors to park at the Aberdeenshire AA Box. Though the door can be opened to reveal interesting photos and message boards, the telephone no longer works. Pictures include the original box in use and images of the restoration work. AA Box 472 in Royal Deeside and the Cairngorms National Park dates back to about 1927 when these Automobile Association Boxes were built to provide their motorcycle and sidecar patrolmen some shelter from the elements: much needed in the winter of Royal Deeside, Aberdeenshire.